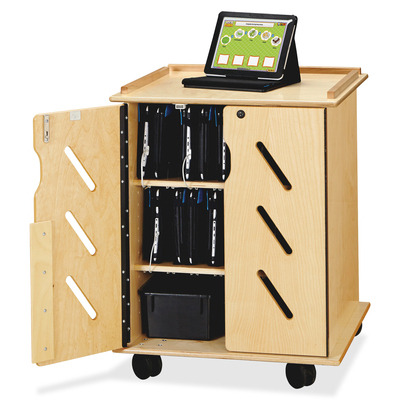 Laptop/Tablet Storage Cart Safely Secures Up To 32 Devices With Style. Unique Cord-Management System Makes Syncing And Recharging Your Devices A Cinch. Reconfigurable Design Can Be Adjusted To Support A Variety Of Devices. Plus, Two Cubby Trays Provide Easy Storage Of Extra Chargers, Cords And Attachments. Kydzsafe Rounded Edges Allow Children To Play Safely Without Getting Hurt By Sharp Edges Or Corners. Dowel-Pin Construction Prevents Weakening At The Joints For Enhanced Structural Support. Ultra-Durable Coating Resists Yellowing Over Time To Keep Your Center Looking As New As The Day You Purchased It. Full-Length Piano Hinges Prevent Small Fingers From Being Pinched When The Door Is Opened Or Closed..
Laptop/Tablet Storage Cart Safely Secures Up To 32 Devices With Style. Unique Cord-Management System Makes Syncing And Recharging Your Devices A Cinch. Reconfigurable Design Can Be Adjusted To Support A Variety Of Devices. Plus, Two Cubby Trays Provide Easy Storage Of Extra Chargers, Cords And Attachments. Kydzsafe Rounded Edges Allow Children To Play Safely Without Getting Hurt By Sharp Edges Or Corners. Dowel-Pin Construction Prevents Weakening At The Joints For Enhanced Structural Support. Ultra-Durable Coating Resists Yellowing Over Time To Keep Your Center Looking As New As The Day You Purchased It. Full-Length Piano Hinges Prevent Small Fingers From Being Pinched When The Door Is Opened Or Closed.